to share a card I recently made following the current sketch from Mojo Monday. giving out for free until October 15th. You can find them Here. 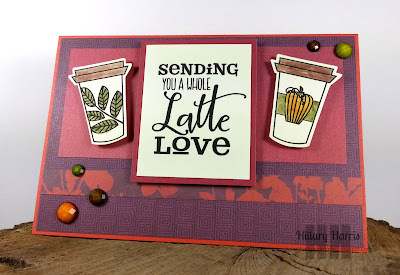 into the Fall Coffee Lover's Blog Hop and the current Verve Inspiration Challenge. great take on the sketch. love those cups. Fantastic card with the Verve freebie digi and gems. really cute, love the colors you used! Sweet take on the sketch with freebie, love it! Lovely card and great use of the digital stamps, Hillary! Happy hopping! Just a beautiful card! Love the mugs and the beautiful fall colors! Lovely card - great take on that sketch, too. Oh, this is such a fantastic take on the sketch. Gorgeous card, Hillary! Love those sweet little embellies. LOVE your take on the Mojo sketch...I went so literal with it...love your card! Love your great autumn colors! Oh I love the Sangria paper. I need to get this pack now! Your card is fantastic. Great design and mix with the digi stamp. Love sangria..love those images. They are great together! Really nice! Really pretty, nice colours & colouring! Stunning colors and like the design paper you used. Great card. Wonderful card with lovely images.